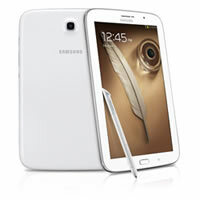 Key difference: The Samsung Galaxy Note 8.0 aims at filling the gap between the Galaxy Note II and the Galaxy Note 10.1. The Galaxy Note 8 features an 8 inch TFT capacitive touchscreen with a resolution of 800 x 1280 pixels. The device is powered by a Quad-core 1.6 GHz Cortex-A9 and 2 GB of RAM. The device runs on Android OS, v4.1.2 (Jelly Bean). 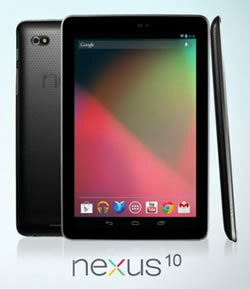 The Nexus 10 is a tablet computer running Android 4.2 (also named Jelly Bean) operating system, which was released with it. It was developed in collaboration with Samsung. The Nexus 10 features a Samsung Exynos 5250 system on chip, a dual-core 1.7 GHz Cortex A15 central processing unit and a quad-core ARM Mali T604 graphics processing unit. Among the number of various companies, Google has also launched its own line of smartphones based on Android, called the Google Nexus. Each device in the Nexus line is produced via collaboration between Google and a leading original equipment manufacturer (OEM) partner. The Nexus devices in general have an advantage over other devices in that the Android in the Nexus devices is pure. I.e. the Android does not have any manufacturer or wireless carrier modifications to it, such as a custom graphical user interface. The Android also has an unlockable bootloader to allow further development and end-user modification, all of which is usually blocked on other Android smartphones. The Nexus 10 features Photo Sphere, a new camera technology that allows one to take 360 deg Panorama shots. The tablet also features a quick settings menu, allows for application of widgets on the lock screen, as well as gesture typing; an updated version of Google Now; and multiple user accounts for tablets. The tablet offers a new share and customize feature that allows multiple users to create their own profile and customize it according to their own needs. The tablet offers a 5 MP rear camera and a 1.9 MP front camera for video chatting. The tablet does not support SIM capability. The device also allows nine people to chat simultaneously using Google Hangouts. The information for the detailed table about the two phones has been taken from the Samsung website, the Google Nexus website and GSMarena.com.